Is There a Kinder Side of Veal? Can the fact that something is "tasty" excuse the commodification of another intelligent, emotional being? When you see a calf, you do not see veal or a by-product, you see an individual, a breathing, feeling, moving animal. Veal is not raised. There is no field of veal stalks reaching tendrils to the sun. Veal is the flesh of calves, specifically young male calves. It's calf meat or flesh. We cannot be that arrogant, that selfish. Can we? Freedom is a male Jersey calf from auction. Bull Jersey and Holstein calves are the by-product of the dairy industry and end up as veal or cheap "dairy beef." At auction, they are sold for between $3-20. Dairy farmers consider them worthless and a money pit, rarely do farmers make money off of these intelligent, beautiful calves. Freedom will live out his days safe and sound at Animal Place. You can help by choosing dairy alternatives, like soy, rice, oat or almond milk or trying one of the many cheese alternatives. Washington Post (October 28, 2009) offers its readers a look into a kinder, gentler, more humane veal. Wait a second, back up. Look at that language, how it muddies up the discussion right off the bat. Veal is not raised. There is no field of veal stalks reaching tendrils to the sun. Veal is the flesh of calves, specifically young male calves. It's calf meat or flesh. Its producers argue that if male calves, an otherwise useless byproduct of the dairy industry, are not ethically raised for meat, they are sold to less-humane veal producers or destroyed. Ouch. Let's be honest about who we are talking about. By-products are inanimate, they have no real moral value. They are things. He is not a thing. This animal you see above is not inanimate. He has wants of his own that often do not align with mine or yours. His personality is different from other cattle. He has emotions and intelligence. I am not using this picture as an attempt at appealing to emotion (but oh goodness, isn't he cute?). But when you see this calf, you do not see veal or a by-product, you see an individual, a breathing, feeling, moving animal. Then there is the notion that gosh, people, if we do not start sending calves to pastures where they can be fattened and slaughtered in a less cruel manner, then we are guilty of sending them to horrible, evil, operations where animals cannot even turn around. 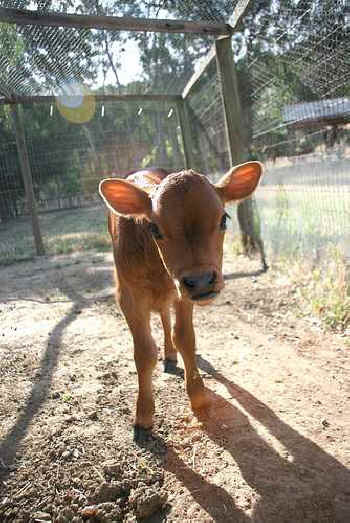 Like most animals, a calf has an interest in life. Perhaps not an interest in pondering ethical matters, like us humans, but an equally valid interest in pursuing all the behaviors that keep him alive. He avoids things that cause him pain and fear. It does not matter if he is sent to a green pasture before he is killed or if he spends 20 weeks in a tiny crate before he is killed. He is killed. His life, which could extend for more than a decade, is denied him. A beverage humans do not need in any manner, shape or form to survive. Dairy milk is not intrinsic to our survival. We are, in fact, the only species to consume the breast milk of another past weaning. For example, one common consumer complaint is that the animals are killed so young. But veal calves are in fact older than chickens, turkeys and pigs and about the same age as lambs when they are slaughtered. Fear no more - calves raised for veal are older than other slaughtered animals! It's true, calves raised for rose veal are slaughtered when they are between 6-10 months of age, depending on the farm and location. Most are killed when they are 6-7 months of age. This is actually the same age as pigs and lambs (who are generally 5-7 months old) and definitively older than chickens raised for meat (who are a tragically young 6-weeks-old). Some turkeys are slaughtered at 6-mos-old, while most are around 4-mos old. This begs the question: SO WHAT? That question deserves capitalization. The reality is that a six or ten month old calf is still a baby. Behaviorally he is a young animal. Physically he is immature. That he happens to be older than other young animals is hardly a winning argument for eating his flesh. Consumers! Please be smarter than that (I have faith you are, seriously). All animals on farms are killed before their normal lifespan. Most important, dairy cows must give birth to provide milk. "If you consume dairy, you should eat veal." This is irrefutable. But I have a different take on it. Instead of eating veal, stop drinking milk. You don't need it. It's made for a bovine baby. It is a non-essential nutrient. There are alternatives. You can get the added supplements and nutrients from other sources. Stop drinking milk, stop supporting veal. It really is that easy. "I think it's really tasty," said Bart Vandaele. Taste. Palate. Gustatory pleasure. I love food. Really, I do. There are so many variations of grains, so many varieties of vegetables and myriad fruit. There are nuts and legumes. The combinations are endless (statisticians may disagree). But can taste be a serious argument for raising animals for their flesh, milk or eggs? Can the fact that something is "tasty" excuse the commodification of another intelligent, emotional being? Can it excuse the separation of mother from calf the day he or she is born? Is the suffering and oppression of entire species' less important than liking how something tastes?